How To Check An A/C Servo Motor - Does Your Servo Need to Be Repaired? You're probably wondering if the A/C servo motor is going bad but you don't want to remove it from the mount to test it. There are a couple of things you could do to check it first. Then find the winding resistance by connecting between the terminals. This should be about 200 ohms, give or take: Larger motors could have a lower ohm value whereas smaller motors could have an ohm value around 100. Next, check the motor at the winding terminals rather than the cable end (in case the cable is old or corroded or the insulation is defective). Disconnect the conductors from the drive control end, and megger (Megometer) between cables and each cable to ground (The megger uses much higher voltages to check resistance than a normal Volt-ohm meter). Between the cables, it should give nearly the same value, (1-3 ohms for medium rated motors, higher for smaller motors). Between each conductor and ground, the megger value should be relatively high: 100 Kohms or above. (More exact values will be specified by the manufacturer; it will also depend on the working environment - corrosive, damp - and the type of motor enclosure). Problem? Go back to the motor and disconnect the cable (isolate the motor). Check the terminals again. This will clue you as to whether the problem is with the cable or with the motor. 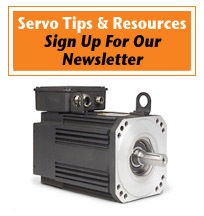 Order servo motor repair from TigerTek if the problem is with the motor. TigerTek offers superfast nationwide servo motor repair service - expert repairs with OEM parts and a One Year Warranty!